Escape rooms are a growing trend these last few years and is booming all over the world. A movie with this phenomenon was only to be expected: Escape Room the movie hit theaters this Friday (March 15). But is such a movie comparable to an actual escape room? Maaike van Leeuwen, Gamemaster at Lock-Clock Escape Room, went to evaluate. Six strangers find themselves in a maze of mystery rooms and must use their wits to survive in order to win $10.000. As the game progresses it becomes clear that not only are the rooms deadly, but they seem tailored to its players. Can they beat the game? And if so, at what cost? Let’s get the obvious out of the way: no-one usually dies in an escape room and you are never in mortal peril. Companies are in danger of a serious lawsuit if you were. But besides this, it is quite an accurate representation of an escape room. No, an escape room is usually not trying to burn you alive, cause you hypothermia, gas you and normally the floorboard stay in so you don’t fall to death but besides that, is looks pretty accurate. The game requires searching, doing puzzles, think out of the box but logical, find clues, attention to detail and sometimes some physical exercise. Actually, if it weren’t for the lethal character of the game, I would sign up too! The movie contains some puzzle that are not new to an experienced player but has some serious cool stuff too. Personally, I would be scared to death to put my hand in a stuffed polar bear to retrieve an object but a brave co-player might’ve volunteered. 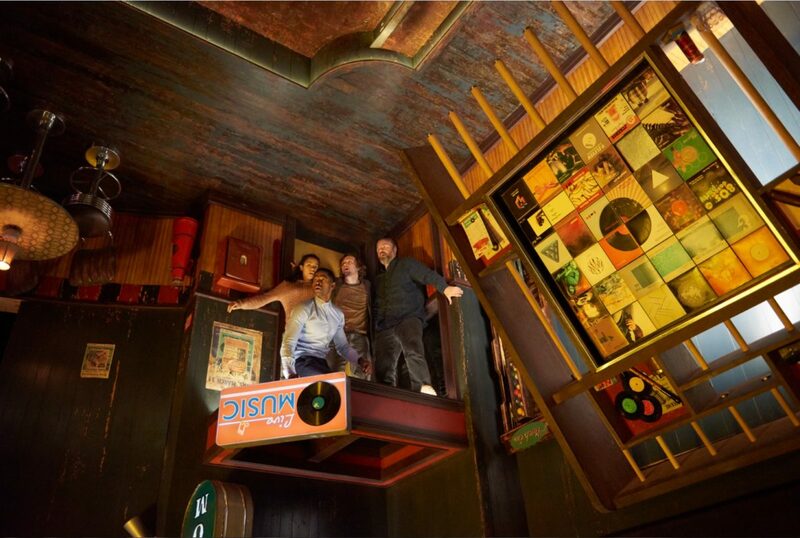 The up-side-down room is one of my personal favorites: aesthetically cool, purpose fulfilling and cleverly implemented. Could it be that the script writers were assisted by game designers? Not obeying the rules and cheating is not appreciated in real life either but luckily in the real deal, you are not drowned under the ice. Game master just won’t like you anymore and sometimes kick you out (which the players in the movie wish that would happen). Minus the lethal encouragement this escape room is quite faithful to a real life version: very immersive, great set design, mix of puzzle, agility, interrelations and logical thinking games, padlocks, secret doors, hints and special effects. This room has it all and more. Moral of the story: don’t accept an invitation to win $10.000 if you beat the game, without doing some research in advance.